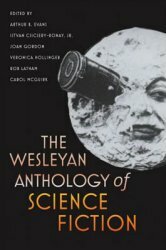 This book was conceived as a project of the scholarly journal Science Fiction Studies, and was a developed via consensus among a group of editors -- after Evans and Csicsery-Ronay, editors credited on the cover are Joan Gordon, Veronica Hollinger, Rob Latham, and Carol McGuirk. Among criteria for story selection was that they should "represent both the best and--not always the same thing--the most teachable stories in the field". Stories are arranged chronologically, with a thematic grouping following the main table of contents. The book ends with a bibliography of books and journals in various nonfiction categories.